Baddaginnie Run is committed to creating high quality wines AND restoring biodiversity as an integral part of production. To achieve these goals we’re establishing a Bio-corridor Network across 50 per cent of our farm that encircles creeks and wraps around vineyards. Bio-corridor networks are the areas of land on which native flora is being restored, protected and connected to other tracts of bush. 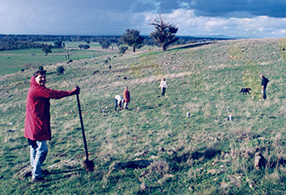 Connectivity is achieved by replanting native vegetation on the empty land between bush, as well as by natural regeneration. When complete the Baddaginnie Run farm bio-corridor networks will extend approximately 2.5 kilometres north-south by 700 metres east-west. We are also working with neighbours to extend the network further. 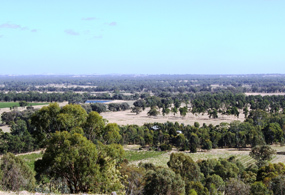 The aim is to create a 5 km migratory pathway linking roadside remnant bush on Violet Plains with original upland forests on the Strathbogie Ranges. This will span an altitudinal gradient of 250 metres and a temperature gradient of 2.5oC, and will enable whole ecological communities to adapt better to climate change. Some of bio-corridor elements on our farm are linear. Those planted along creek lines and roads are some 500 metres long and 60 metres wide, with the inclusion of remnant roadside bush. Other elements are solid blocks; e.g. the Rocky Hill which overlooks the vineyards is an area of 40 hectares, extending 1 km by 500 metres. Stock have not grazed this for 30 years, so it is rich in wildlife. Why are we creating bio-corridors across our farm? Giving up 50 per cent of farming land is not a decision taken lightly. But we are confident it’s win-win for both the health of the whole farm landscape and for the quality of our wines. Our first aim is to create healthy farm landscapes. 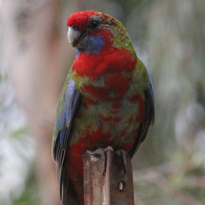 Australia’s biodiversity is in serious decline. 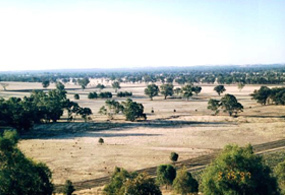 Action is needed urgently if the soil is to sustain continued production of goods in Australia’s dry, ancient land into the long term future. Bio-corridors are an immediate, effective tool for restoring the biodiversity and healthy ecosystems needed to enable agriculture to continue. On our farm bio-corridor networks are bringing life back to the land on which flora has been replaced and also to adjacent areas. Bio-corridors are enhancing soil and water quality, storing large volumes of carbon and creating habitat and connective migratory pathways for native fauna. This allows critters to move to cooler slopes to find feed, as climate change increases temperatures. Importantly, the bio-corridor network gives us immense pleasure. 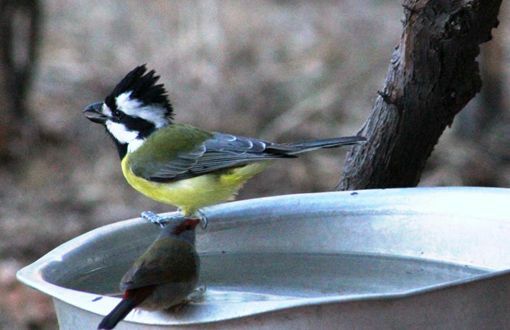 There is so much joy and satisfaction in observing the bush regenerating and the native animals and birds returning. Our second aim is to produce exceptional wines. 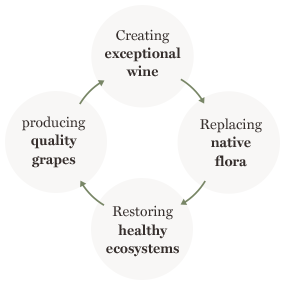 Fortunately, by restoring ecosystems, the bio-corridors are at the same time creating the conditions needed to produce top quality grapes, which then form the basis for great wines. Sale of exceptional wines helps resource more land restoration and grape production. Tim Jones depicts this regeneration circle in the engraving series From the land. For the land he created for Baddaginnie Run. Implementing our Farm Bio-corridors Network is a huge task for a small family company like ours. 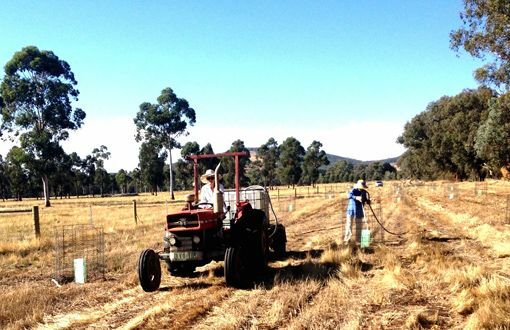 In 2012, just when the scale of the task felt like ‘mission impossible’, our small rural company received an Australian Biodiversity Fund grant. This is enabling us to bring biodiversity and productivity activities together in one integrated farm management unit. The Fund is part of the Australian Government Clean Energy Program. Its purpose is to assist land managers store carbon, enhance biodiversity and build greater environmental resilience. Nationally: we’d like help shift the current farming paradigm from viewing land as an inexhaustible resource that exists for exploitation, to one that respects and honours land as the source of all life. 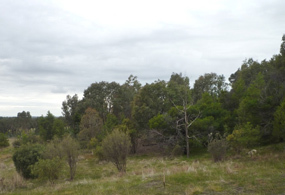 Connect original and recently replanted areas of bush by doing further plantings on vacant lands on established areas, so as to surround creeks and wet lands and to wrap around productivity zones (i.e. vineyards, grazing and paddocks). 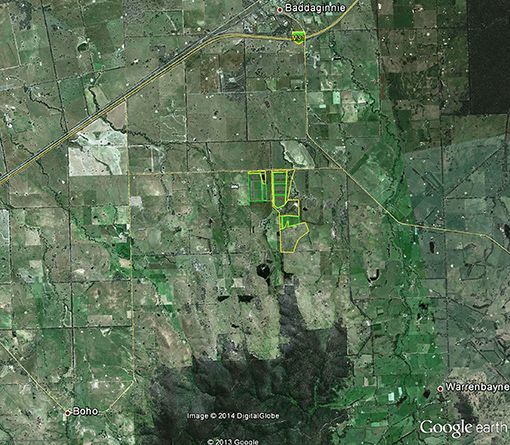 Link original upland forests in the Strathbogie Ranges with our Folly Creek farm bio-corridors web, and through to remnant bush along the Warrenbayne West Rd on the Violet Town plains. 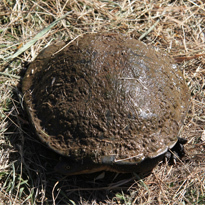 Reduce and control feral pests which kill small native animals, and the weeds that overtake native grasses. Develop and consolidate information on the good practices re integrating biodiversity and productivity. Flora diversity and resilience: Increased proximity gives native flora better opportunities to cross-pollinate. Carbon pools: Permanent native bio-corridors, plus woody agriculture create carbon storage pools in soil and flora. Control of weeds, pests, feral animals: Reduction and where possible elimination is key in managing bio-corridor networks. Knowledge: Information is being developed and consolidated on the ways to integrate biodiversity and productivity. Our dream is for Baddaginnie Run Bio-corridors to be part of a district-wide bio-corridors network that eventually links into the National Wildlife Corridors Plan. 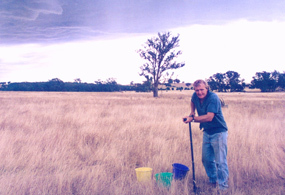 This depends on the interest of other landholders in participating. We respect their diverse views. A valuable first step would be to extend our farm’s bio-corridors two kilometres south, so linking with Strathbogie Ranges’ upland forests. 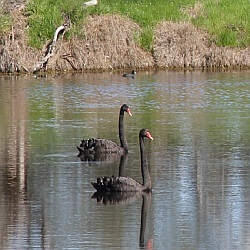 These are home to many creatures that must come down to our plains to source seasonal foods; e.g. robin red breasts. A more ambitious project is to develop a district network in collaboration with Boho, Warrenbayne, Baddaginnie and Violet Town. 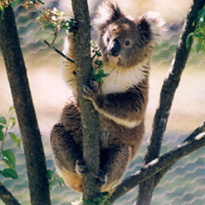 In the 1980s Warrenbayne Boho Land Protection Group began a similar ‘Corridors of Green’ project which achieved a lot. But there’s still a long way to go. Now with GIS, and awareness of biodiversity’s central role in farming, new plans are underway. We aim to create shared maps that record existing areas of native bush (original and replanted) that landholders judge as significant along creeks, roads and dams. 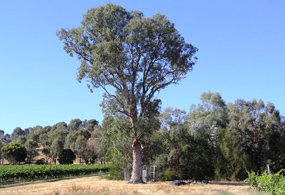 Then it’s a matter of identifying bare land between existing bush areas that landholders would like to replantand connect into bio-corridors. With WBLPG support we are trying to source funds to assist with this project.